Cocoa powder in chocolate brownies will give you a chewy texture while chocolate gives you a dense, and almost fudgy feel. So what you use and get really does depend on how you like your brownies! The more commonly preferred chewy ones or dense like these ones, just play with the ratio of cocoa powder to real dark chocolate. I like my chocolate brownies smooth and without any nuts. Call me fussy but the nuts just interfere with the sheer indulgence of a good, dark brownie – let’s face it, they occupy space where chocolate should be! Unadorned. Unpretentious. Simply the best! 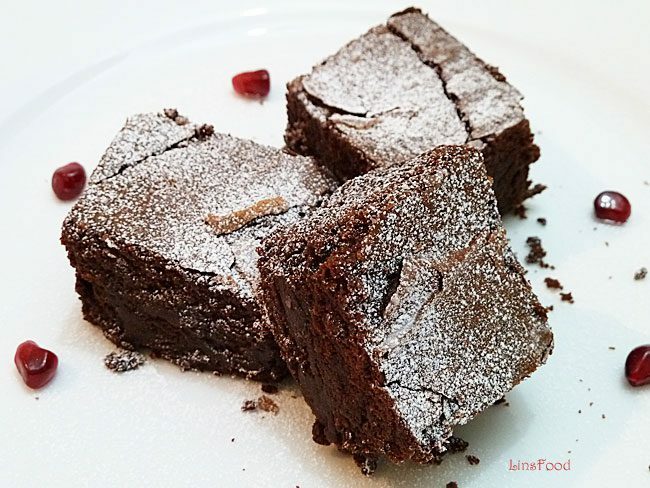 These brownies will give you the much loved dense and dark flavour that a good brownie ought to have. Almost papery top layer, getting progressively dense as you move inwards. Feel free to add a handful of coarsely chopped nuts in there if you like. One of our favourite things to do is adding chopped white chocolate in the mix. The white chocolate caramelises, almost burns as it cooks and gives a lovely new dimension to the final flavour. I make this in a medium sized dish of about 23cm x 15cm (9 x 6). Dark, dense and delicious, these chocolate brownies are so quick and easy to make too! Line the baking dish or brownie pan with baking paper. Break the chocolate up into pieces and place in a microwaveable bowl. Microwave on medium power. Check after 60 secs, stir and continue if not melted at all. Add butter and repeat for another 60 secs. Stir until it's all melted and combined. Leave it to cool for a few minutes. Beat the eggs, add sugar gradually and continue till mixed well. Add the vanilla. Add the chocolate mix into the egg and sugar mix, continue beating slowly for half a minute. Add the flour and combine everything. I use a tabletop mixer and just do it all in it. Pour into the dish/tin and bake for about 45 minutes. Cool and cut into squares., sprinkle icing sugar just before serving. I have a huge tray bake tin (13 x 10) that I sometimes use when I need lots of brownies, same recipe, just double all the ingredients and bake for about 60 minutes or so.